Until recently, serious fungal infections were relatively uncommon and systemic infections very uncommon, particularly in cool and temperate climatic zones. In these zones, a fungal infection usually meant athlete’s foot or oral or vaginal thrush, which caused discomfort but were hardly life threatening. Since the 1970s, however, there has been a steady increase in the incidence. One of the factors aiding the spread of fungal disease has been the widespread use of broad-spectrum antibiotics, which eliminate or decrease the nonpathogenic bacterial populations that normally compete with fungi. Another has been the increased number of individuals with reduced immune responses caused by acquired immunodeficiency syndrome or cancer chemotherapy agents. This has led to an increased prevalence of opportunistic infections such as infections with fungi that rarely cause disease in healthy individuals. The most common systemic fungal infection is systemic candidiasis, an infection with a yeast-like organism. Other more serious conditions are cryptococcal meningitis or endocarditis, invasive pulmonary aspergillosis, and rhinocerebral mucormycosis. Invasive pulmonary aspergillosis is now a leading cause of death in recipients of bone marrow transplants. Colonization of the lungs of patients with asthma or cystic fibrosis by aspergillus can lead to a similar condition, termed allergic bronchopulmonary aspergillosis. While anyone can succumb to a fungal infection, some are more at risk than others. Older individuals, diabetics, pregnant women, and burn wound victims are all more prone to fungal infections such as candidiasis. Treatment for fungal infection can be topical or systemic. Topical antifungals are generally considered as first-line therapy for uncomplicated, superficial, relatively localized dermatomycoses due to their high efficacy and low potential for systemic adverse effects. Systemic antifungal agents are absorbed and delivered to the body tissues by way of the vascular system. The oral route is usually the safest, the most economical, and the easiest route for systemic antifungal drugs. The choice of an oral form over other forms involves a consideration of both drug and patient variables. A growing and aging population, increasing incidence of fungal conditions, the development and approval of new products, additional indications and formulations, and increased worldwide market penetration will be driving factors for this market over the next decade. 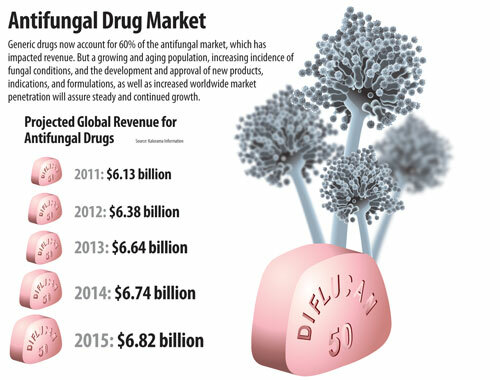 The total market for antifungal drugs is estimated to total $6.1 billion for 2011, increasing 3.2% over 2010. Kalorama expects growth as high as four percent in the coming years with increased demand and product innovation. There are four segments in this market: allylamines, azoles, polyene macrolides, and other treatments. Azole drugs, which inhibit the key enzyme that allows fungi to grow, are the largest segment in the antifungal group by revenues of products sold, with leading products such as Vfend, Noxafil, and Diflucan. Although these brand products still hold large shares of the market, generic penetration is high and continues to increase. Allylamines prevent fungi cell walls from developing, thus blocking them from growing on human skin. The segment is largely driven by the terbinafine products, namely Lamisil and its generic counterparts. The market began to decline with the generic offering of terbinafine after Lamisil lost patent protection. Lamisil sales declined from $978 million in 2006 to approximately $100 million in 2011. New developments for this segment are in the pipeline and several late-stage projects could offset the declining streak this segment has experienced over the past few years. Polyene macrolides are powerful topical antifungals. The segment is highly genericized and is the smallest segment in the antifungal market. All products in this segment have generic counterparts, and new development is lacking. A continued decline of the market will be realized during the next five years. Sales for other antifungals—products that do not fit into one of the three categories above—have shown the highest growth of all segments. Generic competition is strong in the antifungal segment, with roughly 60% of total sales for the segment. This leaves a handful of major brand providers. The high generic product penetration creates a highly competitive environment and leads to added difficulty for new product introductions. The market can expect to see a continued demand for products; however, the low cost of generic products will generate added pressure for marketers of brand products. To remain competitive and secure continued market share, current leaders will need to expand product lines and invest in new development, specifically in niche areas such as the area of fungal infections for immunocompromised populations, such as HIV patients. Generic competition will remain highly competitive. Several antifungal products still used today have been approved for treating infections since the early 1900s; however, newer products continue to provide improved efficacy and safety. The antifungal drug market has become more competitive over the years. New products, both brand and generic, will continue to play a considerable role in the development of this market. Focusing on developing antifungals to treat conditions associated with immunocompromised patients will be a significant factor in product growth and sales. Bruce Carlson (bcarlson@marketresearch.com) is the publisher of Kalorama Information. Kalorama’s recently completed market study, The World Market for Anti-Infectives, is available at www.kaloramainformation.com. How Is the FDA Really Doing?